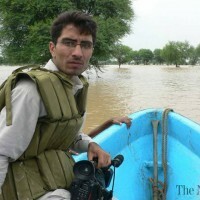 ISLAMABAD – Naseer Azam Mehsud, a journalist covering the militancy-hit areas for his Islamabad-based private television channel, has quit reporting from his bureau in Dera Ismail Khan and has taken refuge in the federal capital following threats from Taliban. Naseer Mehsud left his family members in Dera Ismail Khan and rushed to Islamabad only to inform his employer that he will not be able to report from his bureau after Taliban threatened him with dire consequences. For Mehsud, threats by Taliban to journalists are not something unusual particularly when reporting on developments taking place in North and South Waziristan but this time he says the threats are genuine and dangerous. The fresh threats from Taliban come after militants claimed responsibility for killing journalist Zaman Mehsud. Zaman was killed on November 3 by unidentified men in Tank. He was shot five times triggering condemnation from human rights organizations and journalist community. His killing was claimed by Qari Saifullah group of Taliban. The new group is neither associated with TTP Sheharyar group nor with Sajna faction of Tehrike-e-Taliban Pakistan. Sources familiar with Qari Saifullah group alias Geelaman (dissidents) operates in a totally novel style. Its members unlike other Taliban are clean shaven and consist of youngsters. Soon after Taliban claimed responsibility for killing Zaman Mehsud, the first journalist they contacted was Naseer Mehsud who was warned to give coverage to militants or get prepared for meeting fate of his colleague Zaman. “We cannot give coverage to terrorists after media regulator PEMRA instructed electronic channel not to take version of Taliban. We are in a state of confusion,” Naseer told the Nation. However, his TV channel ha sallowed him to work in Islamabad instead of reporting from the hard area until threats to his life subside. But Naseer is convinced that his movement as journalist in areas like D I Khan, Tank, South or North Waziristan will endanger his life as he resumes his duty in his bureau. His another colleague Shah Zaman who is also President Laddah Press Club has been kidnapped for the last one month by militants followed by threats to his family. Majority of journalists covering from the restive tribal areas have either quit journalism as a profession switching over to other means of livelihood or have asked their employers to induct them in the head offices. Farooq Mehsud is another journalist who said goodbye to South Waziristan and has taken refuge in an undisclosed place after repeated threats to his life and his family members. “We are disappointed that neither the provincial nor federal government has ensured security for journalists reporting from the hard areas. Nobody compensated family members of Zaman Mehsud. I don’t want to meet the fate of my colleagues,” Naseer Azam said. He said the outlawed terrorist faction accused journalists of showing footages of women IDPs which is contrary to the traditions of Pashtuns. “I have two options — either to quit the profession or leave the area from where I report,” he said.